Gardaí have reported that a member was subjected to "racist comment" as protesters brought Dublin city centre to a standstill yesterday. Up to 1,000 demonstrators last night gathered at the scene of Tuesday evening's eviction on North Frederick Street. Gardaí defended assigning masked officers to the eviction. A small number of these protesters were arrested and gardaí now claim that one of their members was subjected to racial abuse. 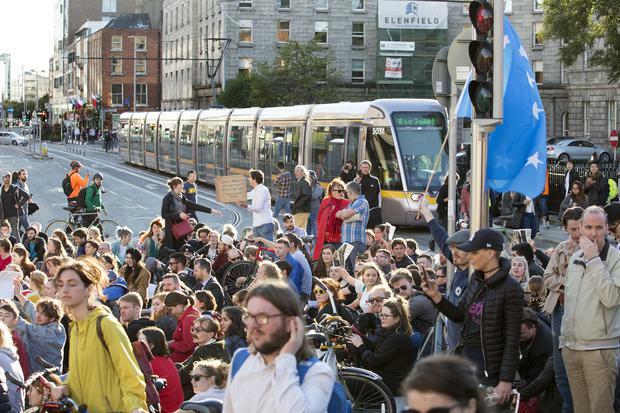 At the height of the evening rush hour, protesters sat down en masse at the junction of O'Connell Street and Parnell Street for about an hour, leading to the suspension of services on the Broombridge Luas line. There were also delays of around half an hour to 10 Dublin Bus routes. Traffic came to a standstill as demonstrators weaved their way along Gardiner Street where three Dublin Fire Brigade trucks were deployed after protesters allegedly set off a fire alarm. The previous night, a crowd had gathered to demonstrate against housing activists being removed from the building on North Frederick Street on foot of a High Court order. Gardaí were criticised after members of the Public Order Unit were deployed to the scene with their faces covered. They stood in front of balaclava-clad men who undertook the eviction. While the activists left the building peacefully, arrests were made later during a protest outside the property after confrontations between demonstrators and gardaí. The Irish Independent has learned that one of those arrested, a man in his 30s from north Dublin, was found in possession of a butterfly knife. The weapon was seized and the man will appear in court charged with a public order offence and possession of an offensive weapon next month, along with a second man aged in his 20s. Five people were arrested in total and all have since been released from custody. Two other people were given adult cautions, while another was released and a file is being prepared for the Director of Public Prosecutions. Major concerns have been raised about the masked and unidentified men carrying out the evictions. The group, wearing balaclavas and with no clear identification, arrived in a UK-registered Mercedes Sprinter van which displayed no clear labels or logos. Despite reports that the van was not taxed and insured since 2014, a Garda spokesperson said they were satisfied "the vehicle in question is tax and insurance compliant". Gardaí have also been criticised after members of the Public Order Unit were deployed to the scene with their faces covered. However, a Garda spokesperson said they were "fire retardant hoods and are part of the safety equipment" for members. "You can also see in the photograph that Garda numbers identifying the gardaí are visible on their uniforms. The Garda's only role in the proceedings was to prevent a breach of the peace," the spokesman added. Following the protests, the name and picture of one garda alleged to have been on duty at the protest was shared on social media along with derogatory remarks. Gardaí wrote on their official Twitter account; "A small number of the crowd outside subsequently were arrested for a breach of the peace. One Garda was assaulted and subjected to racist comment." GRA spokesman John O'Keeffe praised gardaí for their restraint "in the face of provocation". "The idea that our members were somehow part of the problem is errant nonsense. "On the contrary, they were there to prevent a breach of the peace occurring and that is exactly what they did. "The GRA thanks them and all our frontline for their professional service in this regard," Mr O'Keeffe said. The activists were removed from the property at 34 North Frederick Street, as they had been defying a court order by remaining in the building for a number of weeks. Take Back The City, the group behind the occupation, criticised both gardaí and the security guards who carried out the eviction. It said it condemned the security firm which had "illegally carried out forceful evictions on occupants".